Aspiring documentary filmmakers may spend years in post-graduate school learning the genre, and years after that honing their skills, before ever reaching what for some is Canadian documentary nirvana - the National Film Board (NFB). But for Nancy Wilson of Lunenburg, the path to Canada's film and digital media producer and distributor has been surprisingly quick. 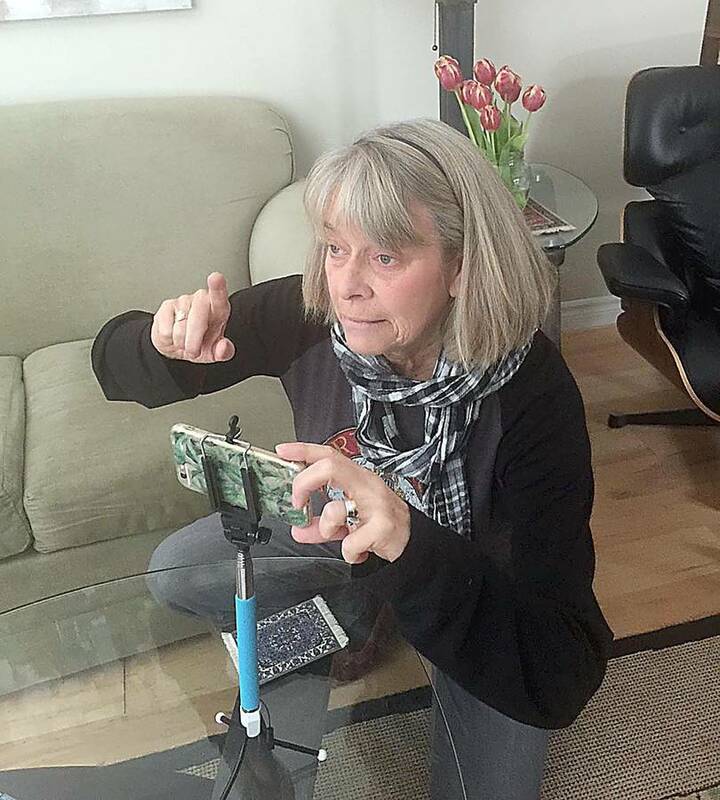 The retired school psychologist, who first began dabbling in film in 2016 at a free seniors workshop through the Lunenburg Doc Fest, learned last week that the amateur documentary footage she created on her smart phone is now under consideration to become an NFB film. "I'm working towards directing and co-producing a full-length documentary for the National Film Board, yes," Wilson confirmed to LighthouseNOW last week, adding, "using only my footage off the iPhone. "It makes me want to cry," she squealed in delight. If all goes according to plan, the 500 minutes of footage she has on her phone will be pared down to a 44-minute NFB film. It's quite a leap for someone whose love of film previously had manifested itself in watching Netflix or going to the movie theatre, and whom welcomed the chance to participate in the Lunenburg Doc Festival's free workshop on documentaries for seniors largely because, if anything, if would give her something to do during the summer. As it turns out, she found the workshop "amazing." The weeks-long training had participants working independently to create a four-minute documentary using only their smart phones. During the process, they were mentored on aspects such as audio and lighting. It was suggested they pick a topic that inspired them, and Wilson chose the Shambhala meditation group, which is based in the Mahone Bay Centre and of which she considers herself a "rookie" member. Wilson titled her four-minute documentary Eyes Wide Open. "Most people think when you meditate, you close your eyes and you kind of remove yourself from the world. "In the Shambhala tradition, your eyes are wide open because you are present to everything that's happening. You are not in another state of mind," Wilson explains. Enthralled by the documentary workshop, Wilson was inspired to carry on with her project. She kept chipping away at her documentary, filming group members and some of the spots they chose to meditate. 'I just want to honour these people because they certainly had helped me out, and I learned a great deal," she says. Eventually she had accumulated the 500 minutes of raw footage. "It just grew and grew and grew." Wilson says one of the valuable lessons she learned at the 2016 workshop was how to pitch one's documentary. She credits one of her mentors, filmmaker Dawn Harwood-Jones, as being a big help in pushing her forward with this. "It takes a great deal of confidence. Ooh. I had to muster that big time to approach the NFB," she admits. To meet the NFB's strict criteria, she was required to submit a 30-second film clip, along with an explanation as to why she believed the information would be appealing to the general public. About six weeks after sending that off to the NFB's Atlantic production studios in Halifax, she received a formal letter back indicating the NFB was "'considering the idea.' Nothing else." However, from there Wilson progressed to what she says is the "investigative level," which required her to pitch her documentary directly in Halifax. And when LighthouseNOW caught up with Wilson on February 1, she had just learned she is now into "research and script. "So I'm now at the third level," she explained excitedly. According to Wilson, this means she will be assigned a producer who will act as a mentor. The amateur admits that while some filmmakers apply to the NFB for financial backing, since the agency will fund up to 49 per cent of a production's budget, she herself has no such inspiration. "I have no budget. I'm not interested in a budget," she insists. "My concern was being able to get mentor-ship in terms of production and editing. And I think I'm nearing it." Wilson was advised that the 500 minutes could be pared down to the 44-minute production and in the NFB library a year from now, after which the NFB will take its marketing on board. In the meantime, the retired school psychologist notes that the NFB has a "flattering name" for novices such as herself. "It's called 'emerging filmmakers.' So I am an emerging filmmaker," she says incredulously.